Overview: Excellent quality and value Microphones and Pre-amplifiers offering a very linear response, hand built in Sweden. 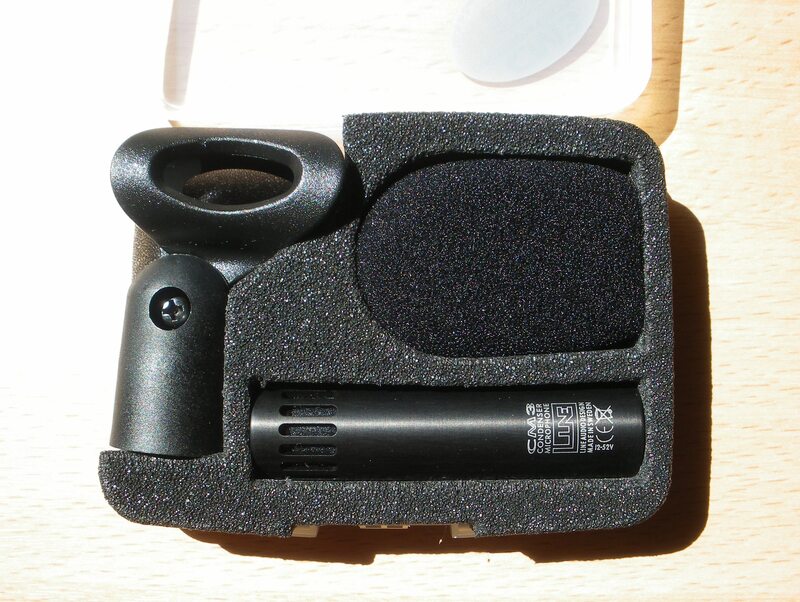 Small size sub-cardioid condenser microphone. Our opinion: One of the most neutral microphones on the market and the only one in its price range with a truly neutral sound. A must have. This little microphone has a natural, detailed and balanced response. Perfect for natural reproduction of acoustical instruments such as members of the bowed and plucked string-families, grand piano, brass, percussion, overhead choir and voice -with a minimum of colouration. The response is smooth and flat even at an angle. The CM3 is tough enough to handle drums with full depth and punch, drum overhead clearly and crisp without strain. It even handles amplified instruments. It's suitable for professional studio and PA use, with a pricetag at the hobbyist level. During manufacturing each capsule is measured, selected and trimmed to close tolerances. Out of range capsules are rejected. This in combination with the internal circuitry, results in a response with a unique flatness. These are quality microphones made for demanding situations. Windshield and holder/clip included (as shown). TYPE: prepolarised Sub-Cardioid condenser microphone. Frequency response: 20-20000Hz (100-16000Hz+-1dB on axis!). Phantom power: 12 - 48V. Current consumption: 3.5 mA. Max SPL: 135dB @0.5% THD (130dB@24V, 120dB @ 12V). Small size Omnidirectional condenser microphone. Our opinion: Like the CM3, the OM1 is extremely neutral and unique in its price range. Perfect for location recording, Classical music and also in the recording studio. Free Field/Linear response. This omnidirectional microphone has a natural, detailed and balanced response. Perfect for natural reproduction of acoustical instruments such as members of the bowed and plucked string-families, grand piano, brass, drum overhead, percussion, overhead choir and voice -with a minimum of colouration. The response is very smooth and flat, with fine off axis performance. It's suitable for professional studio and PA use, with a pricetag at the hobbyist level. The small size (about the same as a normal XLR plug) makes it easy to place, without being in the way. Its size and black colour makes it close to invisible on stage. 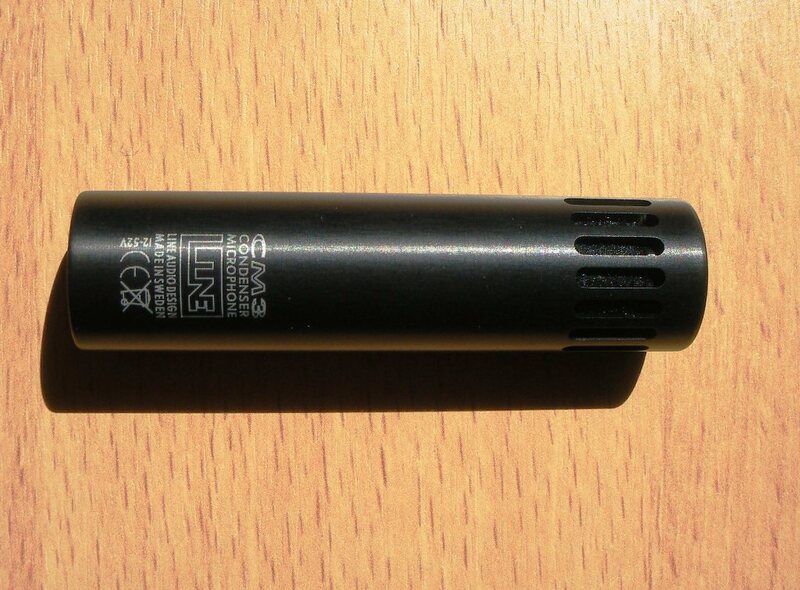 TYPE: prepolarised Omni-directionnal condenser microphone. Frequency response: 20-20000Hz +-1dB (on-axis, at 1m distance, 1/12 octave narrow smoothing, 23 C). Phantom power: 12 - 48V (P48 recommended for best performance). Current consumption: 4 mA. Max SPL: 133dB @0.5% THD (130dB@24V, 120dB @ 12V). Fitted with combo EU/US size metal thread adapter - will fit mic stands worldwide. 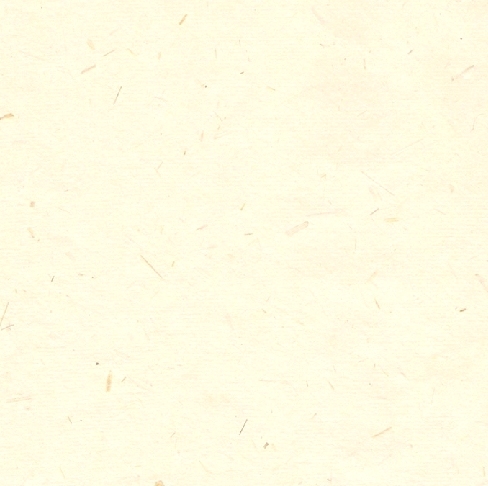 For CM3 and other pencil mics of approx. 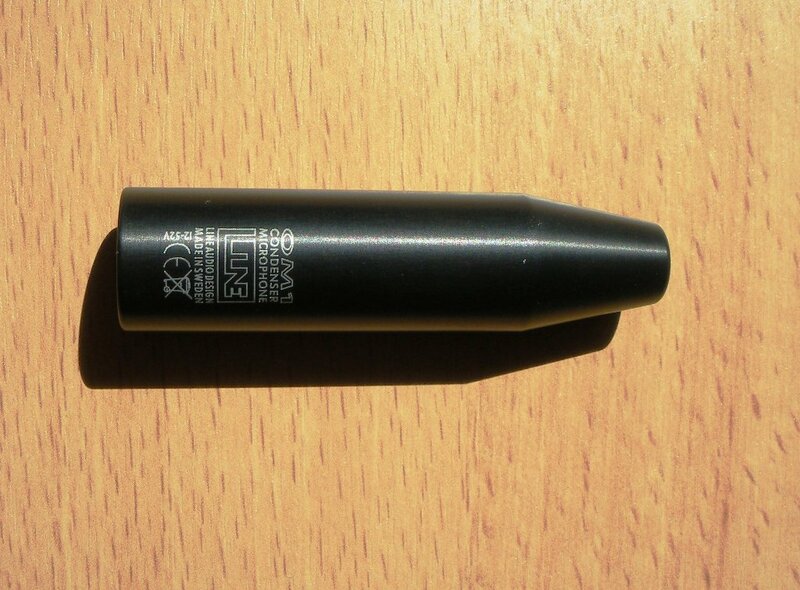 20mm diameter. Removable plastic adapter to fit CM3 body - remove for Neumann KM Series and other mics. Durable metal and high grade plastic construction. 2 channel / standalone Microphone Pre-amplifier. Our opinion: Very quiet, clean and uncoloured mic preamp offering a linearity not found in other units in its price range. The design is DC-coupled throughout, except for the matched plastic film input capacitors and is based on a low noise, discrete, class A, matched transistor differential pair input stage, followed by low noise, low distorion O/P-amplifiers. Overall the signal path is short and audibly transparent. 8 channel / 1U Rack Mount Microphone Pre-amplifier. Our opinion: As the 2MP, but offering incredible value: 8 totally clean 60dB preamps in a 1U rack format. Gain: 60dB with balanced output. (with unbalanced output 54dB). 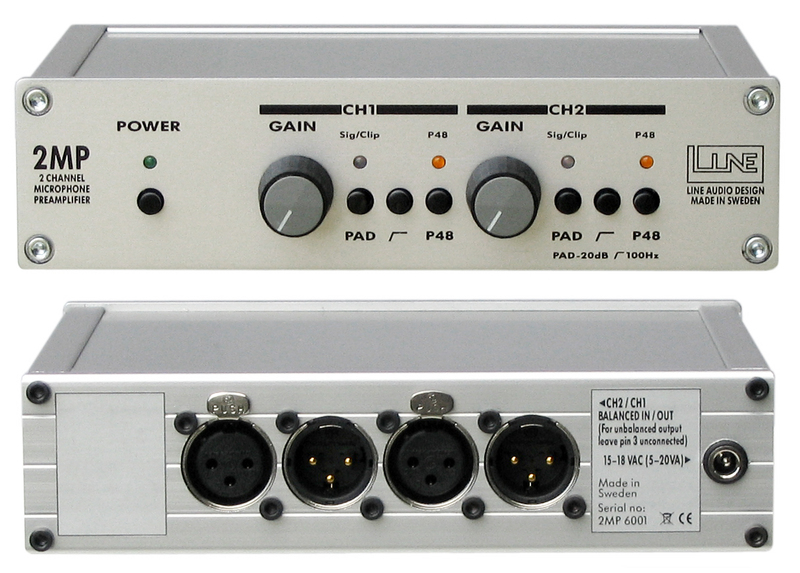 The gain of the input stage has two fixed settings giving max 60dB or 40dB gain. Output DC offset: max 1mV at 40dB gain, max 10mV at 60dBgain. XLR Polarity: Pin 1 ground, pin 2 positive, pin 3 negative. Size 2MP: 173 mm (W), 44 mm (H), 158mm (D). Size 8MP: 483 mm (W), 43.7 mm (H), 153mm (D). Depth behind rack rail: 131mm. This product is designed and manufactured in Sweden. Specifications may be subject to change without previous notice.